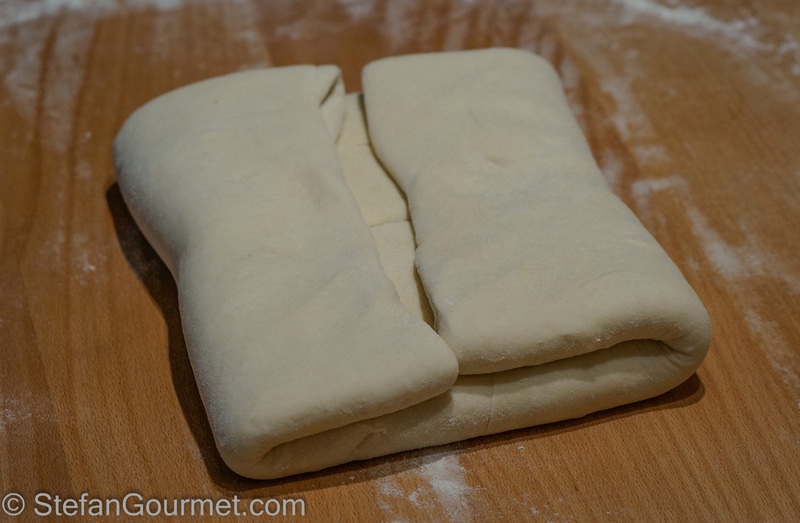 The approach is very similar to puff pastry: make layers of butter and dough, roll out, fold, rest, roll out, fold, rest, etc. Temperature control is important. 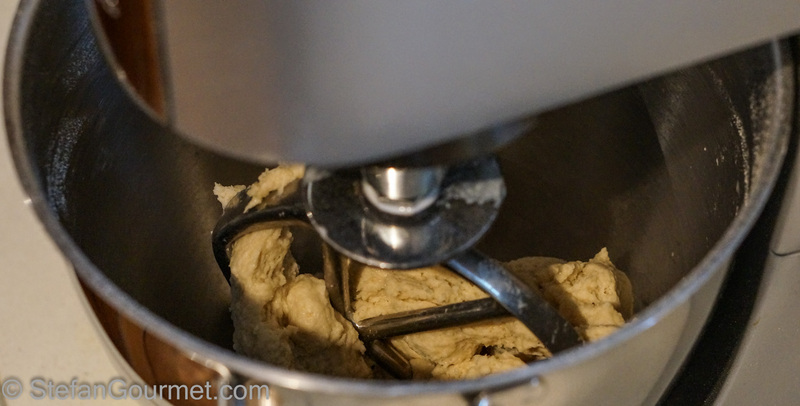 If the dough or the butter are too warm they will be too soft and are impossible to work with. If the butter or dough are too cold, they will be too hard and difficult to work with. This means that the time in the refrigerator, the room temperature, and how much you handle the dough with your (warm) hands will all have an impact. For a first try the croissants and pains au chocolat turned out pretty good, although next time I will make them a bit smaller as these were almost a full meal each. This time I used strong (bread) flour rather than pastry flour, which made the dough more elastic (more gluten). Although those gluten also help to maintain the all-important layers, I may try pastry flour the next time around. 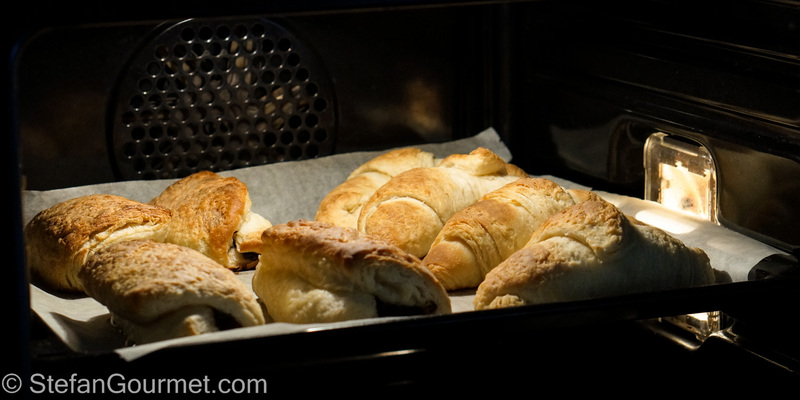 The croissants and pains au chocolat were very flavorful, tasted of fresh butter, and were definitely worth the effort. 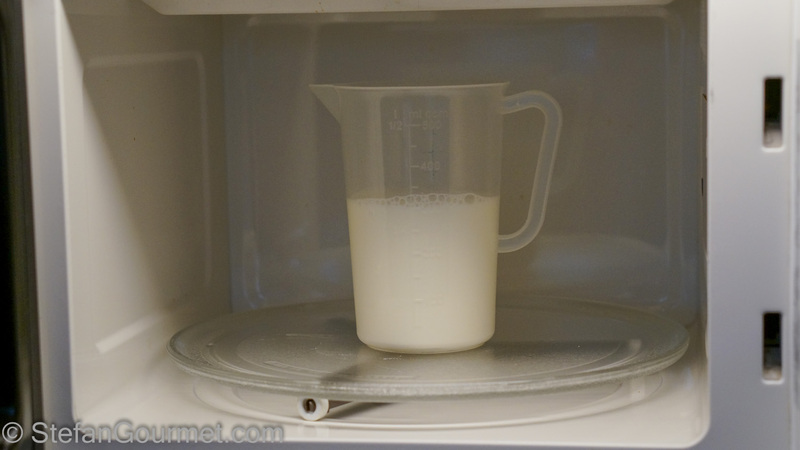 Warm up the milk to lukewarm (30ºC/85ºF) in the microwave. 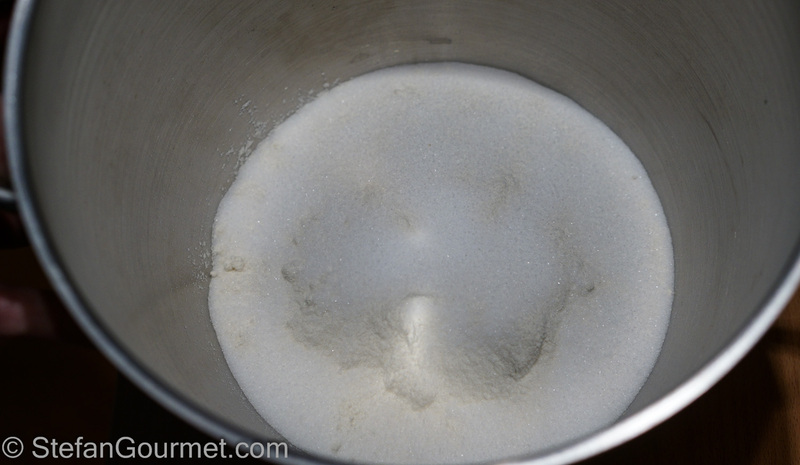 Add the yeast and sugar and stir to mix. 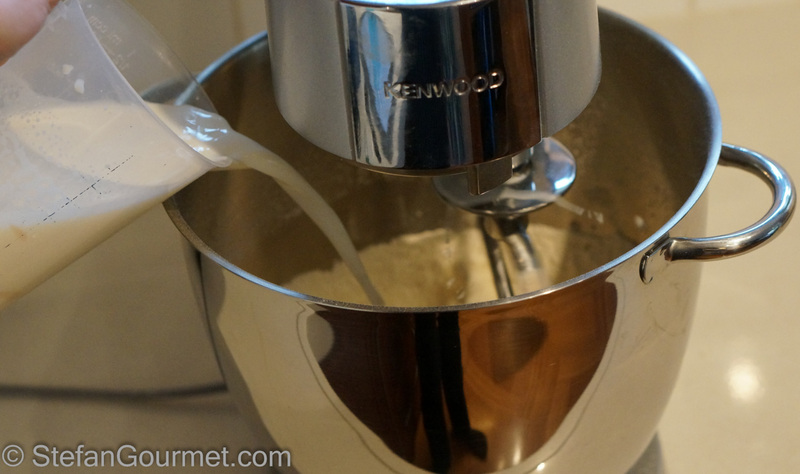 Put the flour and the salt in the bowl of a stand mixer fitted with the paddle attachment. 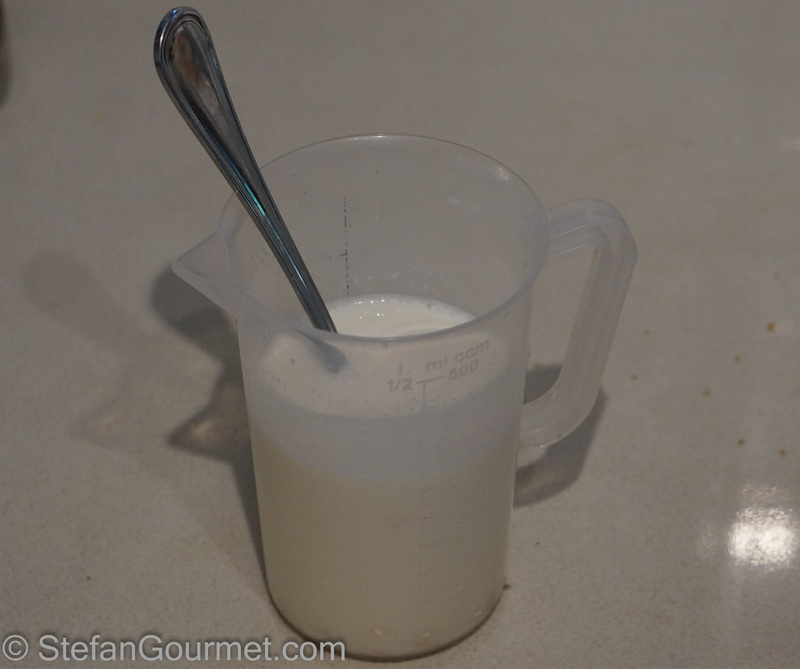 Turn on the machine on slow speed and slowly add the milk with the yeast and sugar. Continue to mix until the dough has come together. 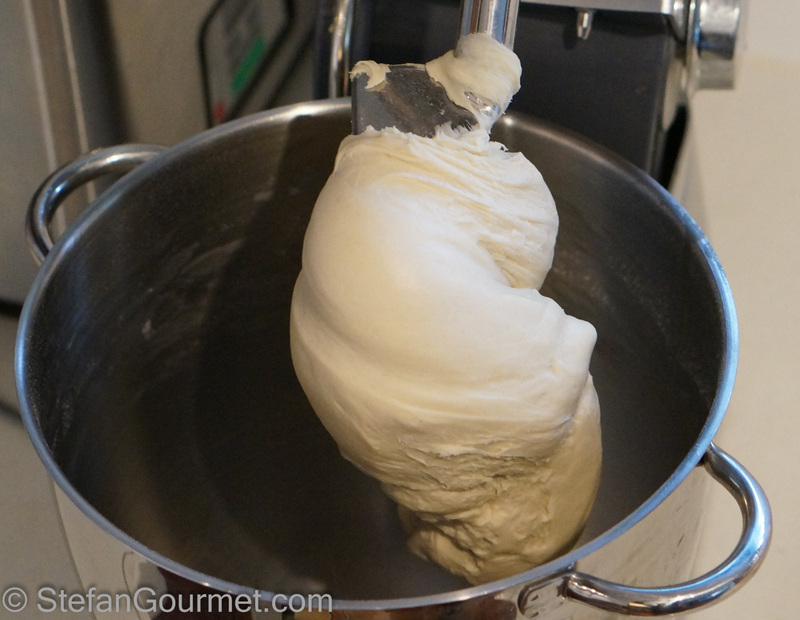 Switch to the dough hook and knead for 10 minutes on medium speed until the dough is smooth and elastic. 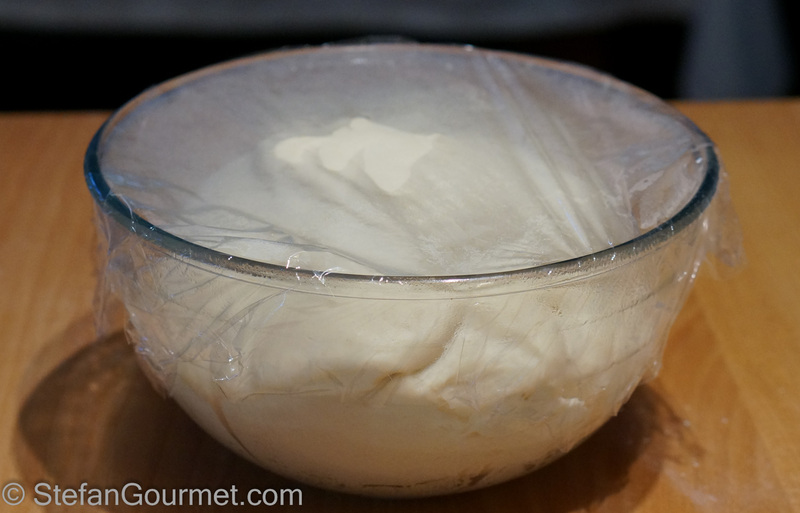 Transfer the dough to a bowl, cover with plastic wrap, and allow to rise at room temperature until doubled in volume, about two hours. 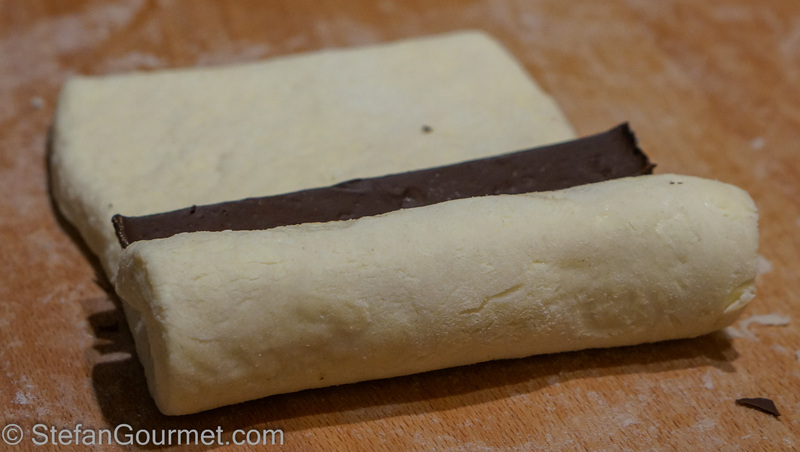 When making pains au chocolat, now is a good time to turn the chocolate into sticks. 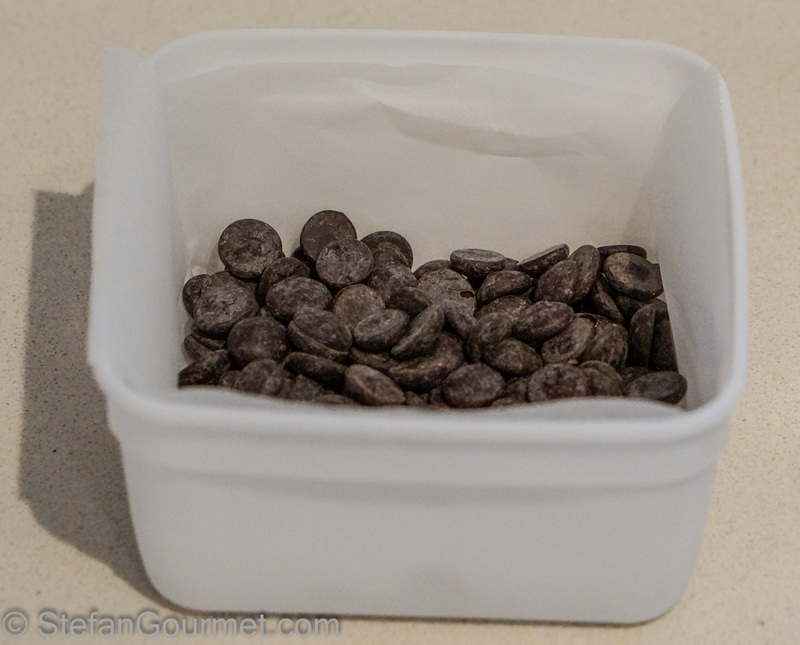 Line a square or rectangular container with parchment paper and add the chocolate chips or pieces of chocolate. 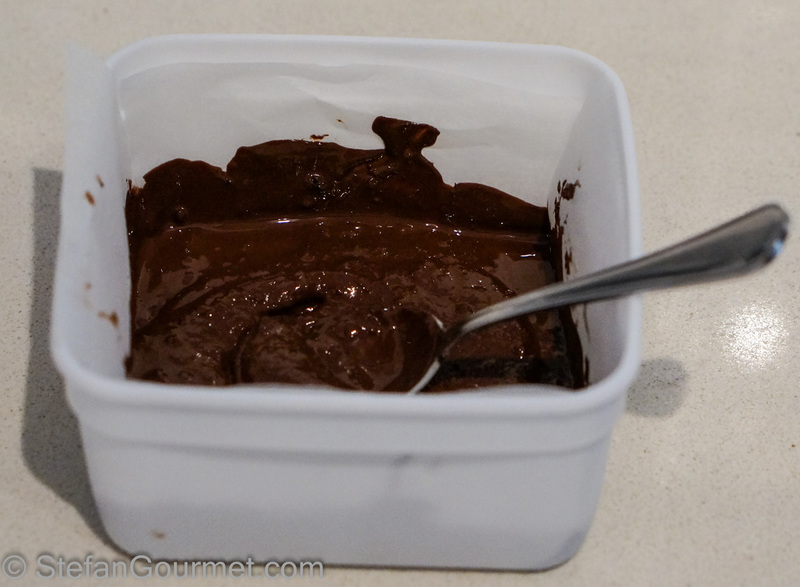 Heat in 10 second bursts in the microwave, stirring between bursts, until the chocolate has melted and is smooth. Flatten the surface and allow to cool to room temperature. The chocolate will solidify. 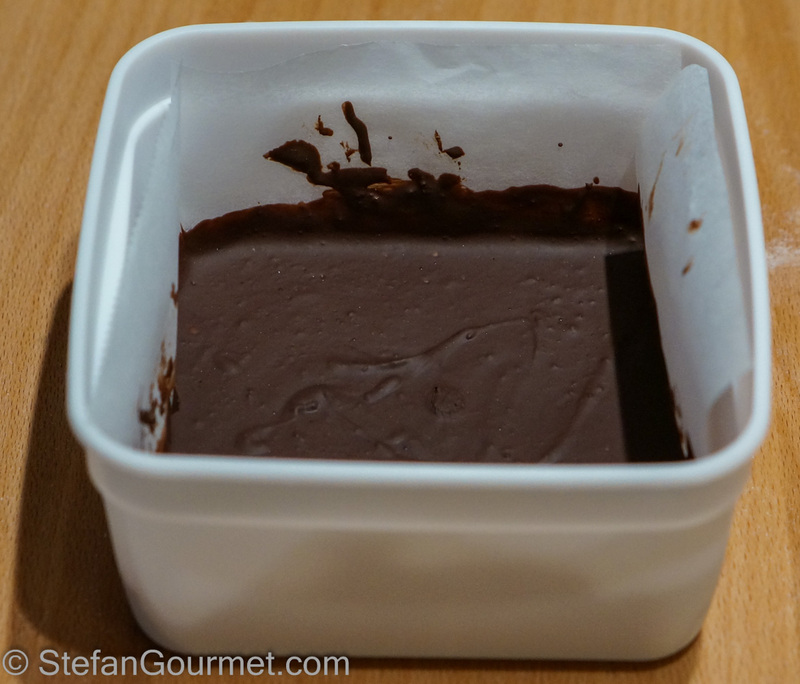 Take the chocolate out of the container and cut into sticks. 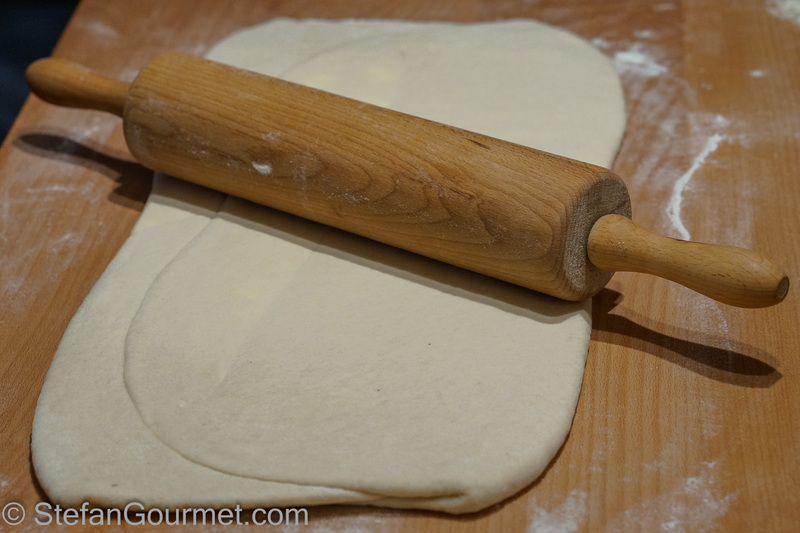 …and use a rolling pin to flatten it. The butter should be cold, so it helps to hit it with the rolling pin. 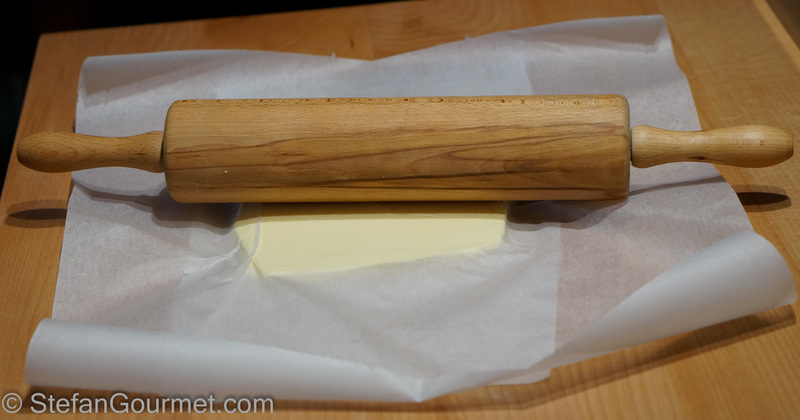 Roll out the butter to about 20 by 30 cm (8 by 12 inches). Wrap it in the parchment paper and refrigerate until needed. 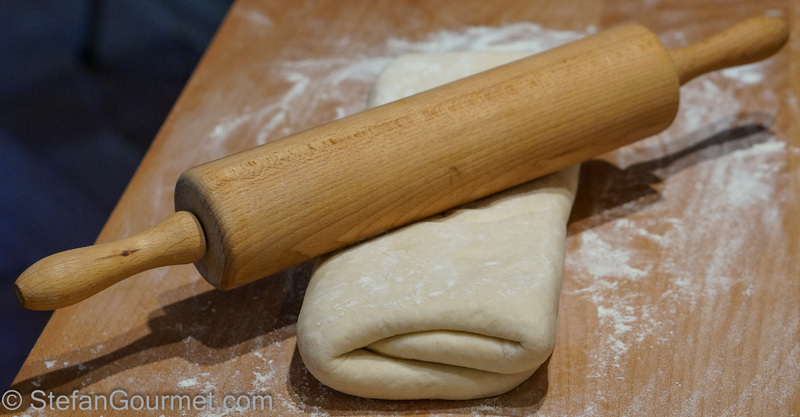 After the dough has risen, sprinkle a wooden work surface with flour and use a rolling pin to roll out the dough to at least twice the size of the slab of butter. 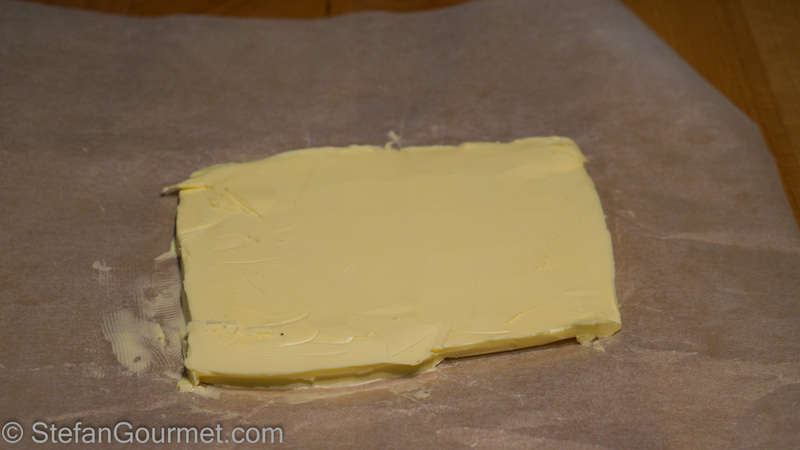 Take the butter out of the refrigerator and put it on top of the dough. 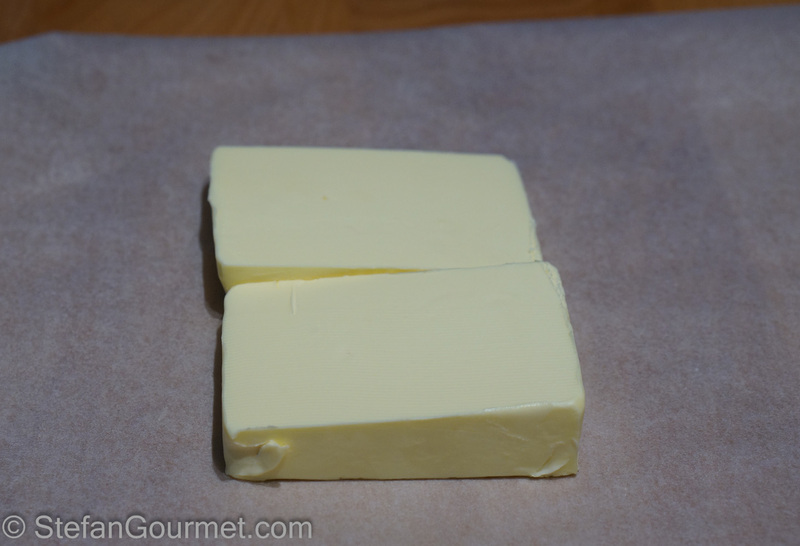 …such that the butter is completely wrapped. Turn over the parcel such that the ‘seem’ is at the bottom. 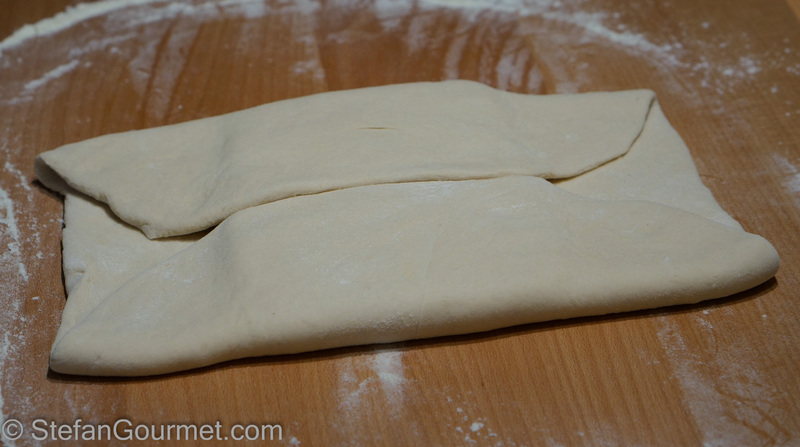 Now roll out the dough to about 30 by 50 cm (12 by 20 inches). 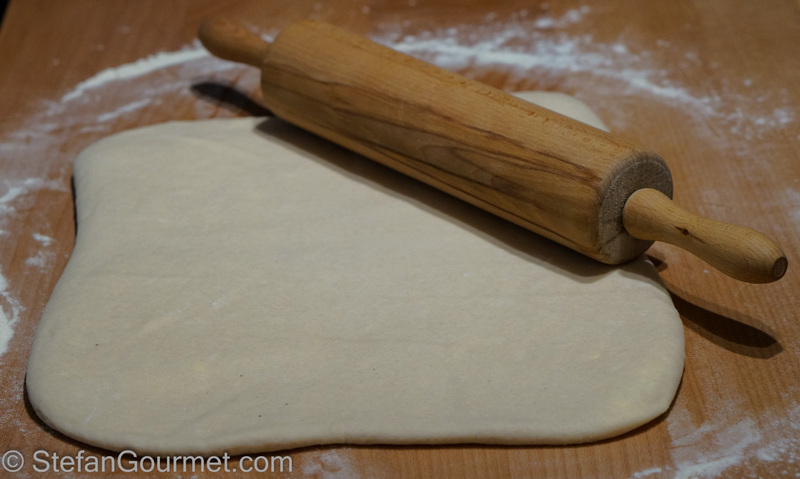 Use the rolling pin in both straight and oblique directions to keep a square shape. …and fold the other 1/3 on top of that. 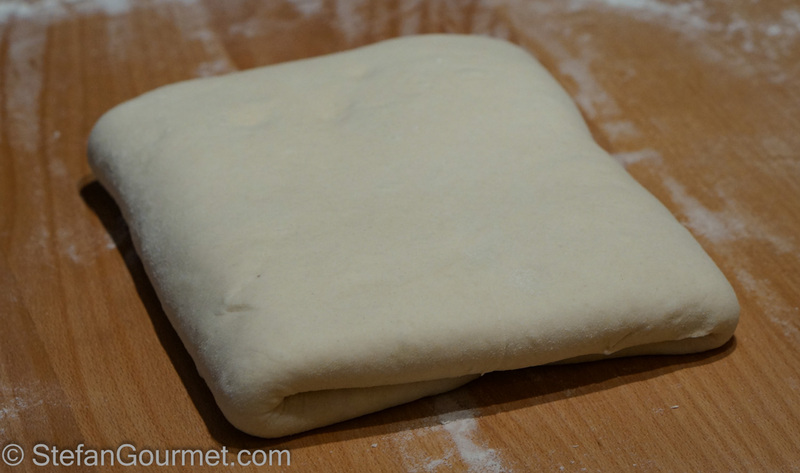 Wrap the folded dough in plastic wrap, and refrigerate for half an hour. …and roll it out to 30 by 50 cm (12 by 20 inches) again. Fold it again, wrap it again, and refrigerate it again. 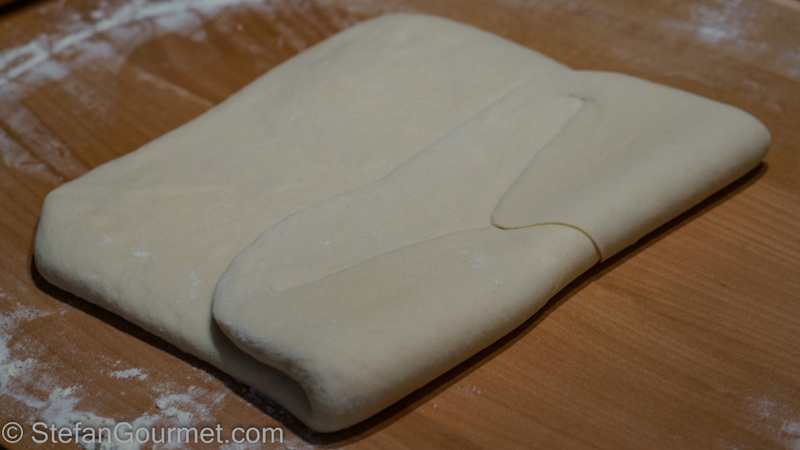 Repeat until you have folded the dough at least 4 times. Roll out the dough one final time, to about 45 by 60 cm (18 by 24 inches). It is actually better to make the dough thinner and the triangles more narrow than is shown here. 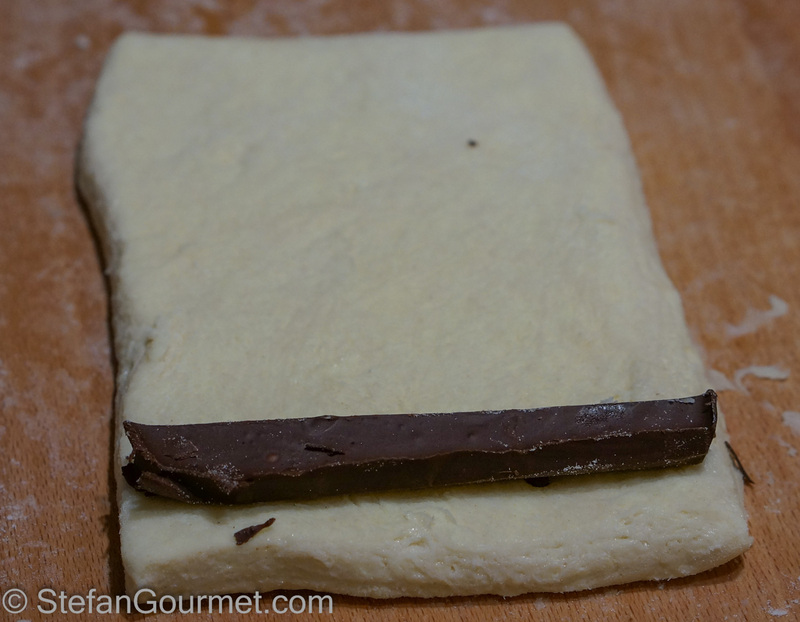 …or into rectangles for pains au chocolat. A pizza cutter is handy for this. 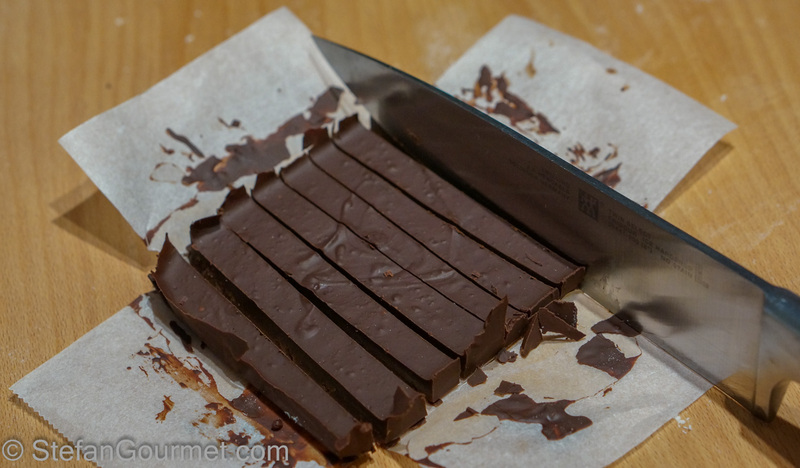 …then roll it up and add a second stick of chocolate as soon as you have covered the first. Then continue to roll until the roll is complete. 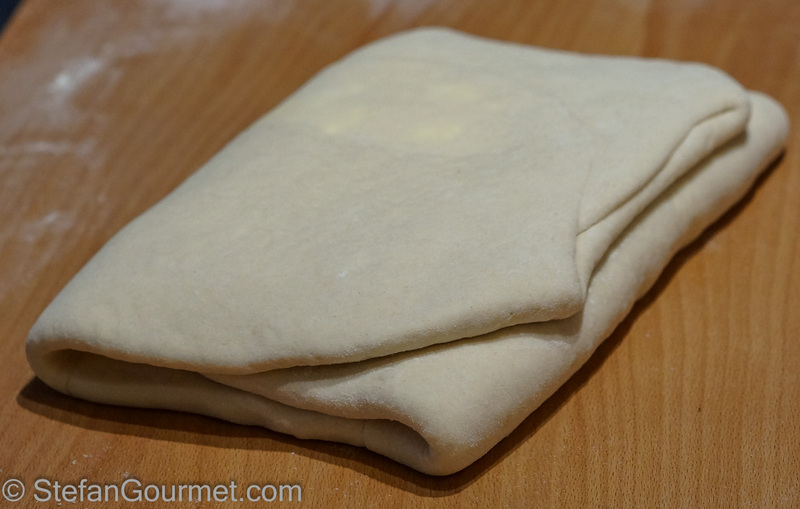 For croissants, roll up each triangle starting at the base and ending at the tip. Bend the croissant slightly after rolling to give it the traditional shape. Arrange the pains au chocolate and/or croissants on a baking sheet lined with parchment paper. Cover with a dish towel and allow to rise for one hour. At this point you can also refrigerate them overnight to bake them for breakfast. Then they go straight from fridge to oven. Preheat the oven to 240ºC/465ºF (fan off). 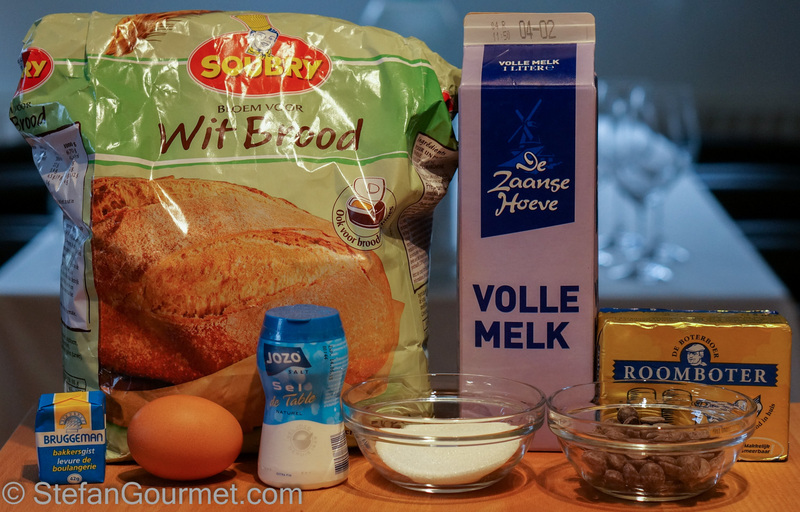 Optional: brush the tops of pains au chocolat and/or croissants with beaten egg before baking. Bake for 15 to 20 minutes or until golden brown on the outside and cooked on the inside. They are best eaten when still warm. 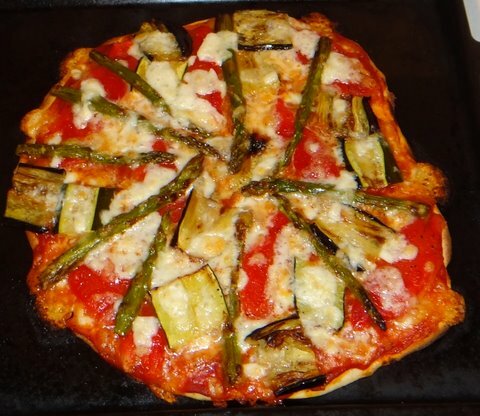 Two years ago I presented this pizza with roasted vegetables. I now make pizza with an aluminum pizza plate and cold-fermented dough (and I take better pictures), but this topping is something I’ll make again. When I stayed with my friend’s family in a tiny French town, her father would pick up croissants for us every morning. The chocolate were my FAVORITE. Yours looks just as good, Stefan. The perfect treat for a special morning. If one makes puff pastry, can croissants be far behind? While in Paris, my day wasn’t complete without a pain au chocolat, whether for breakfast or mid-day snack. Much credit to you for not just trying to make them but for succeeding. 1) these are all about eating them when they are hot. Also the rolling out and chilling is what takes all the time. Therefore, and given that there are not a lot of people to cook for around here most of the time, I need to find a way to store the uncooked dough. I’m wondering about either rolling up the sheet in parchment paper, or cutting the triangles and squares – then refrigerating. I would not want to freeze, as this will kill the yeast. What are your thoughts about the refrigerated storage of uncooked dough? 2) The cooking temperature is going to vary with the number you are cooking and their size. 20 minutes is suggested. For my circumstances, 12 minutes turned out to be the sweet spot. 3) is there advantage or disadvantage in letting them warm to room temp before plunging them into the oven? 4) DON”T. Ever try to cook a single one in the microwave. just don’t. 5) the variety and possibilities are astounding! Cheeses, jams, chocolate, sausage, as well of course as sizes – from little one biters to massive feasty croissants. 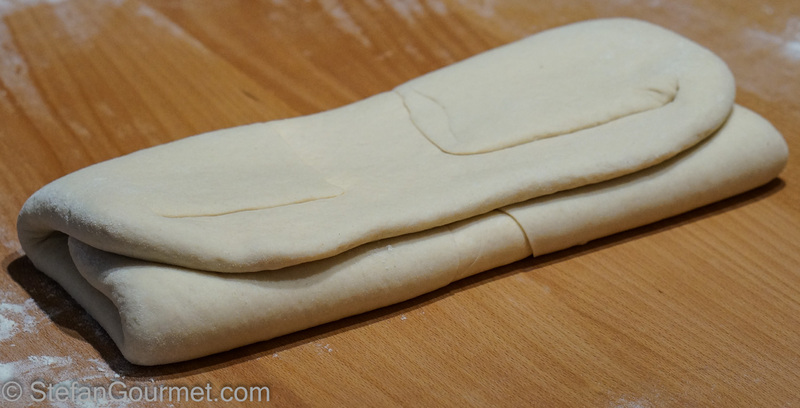 6) And what happens if instead of this dough with less butter, and yeast instead – as well as milk – you used puff pastry dough in the same way. WOuld it still be a croissant? 1) I don’t think the uncooked dough will keep for more than a couple of days in the refrigerator. What I would do is to bake them for a couple of minutes short, and then freeze them. Defrost and then reheat and finish baking in the oven. 3) I don’t think that will make much difference, provided that they have risen properly before you plunge them in the oven. 6) Technically it would not be a croissant, but that doesn’t mean it wouldn’t be good. Now I wonder about sourdough croissants? !